where our team of writers love to talk all things books, sharing reviews, features, lists, interviews and more. Getting lost in a book is escapism at it's finest and it's what everyone who contributes here thrives on. 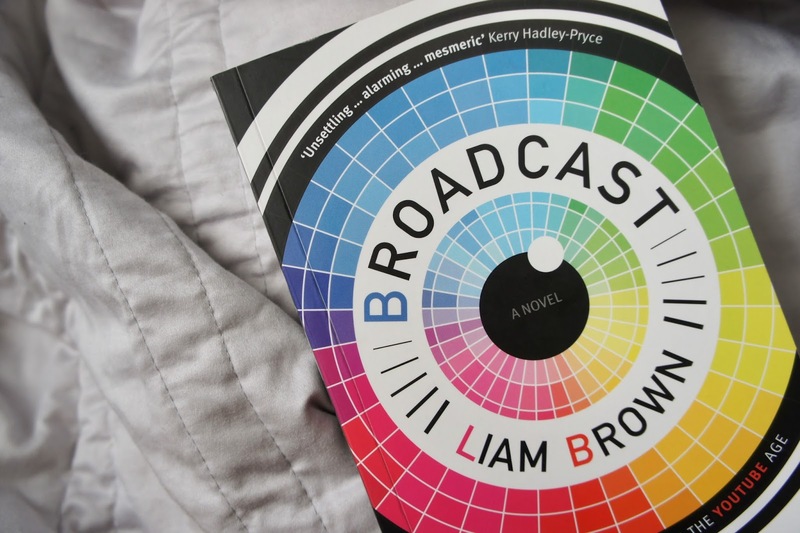 As we announced last week, this month's BB book club pick is Liam Brown's Broadcast, a novel which explores the topics of social media and living our lives online. The book follows popular vlogger David, who is presented with a unique opportunity to expand his audience and be the first star of a new show called MindCast where his every thought, feeling and memory is live-streamed to the world. Whilst we may not all be YouTube stars like David, most of us have and regularly use at least one social media account - it's just a part of modern life, right? We know that many of our readers are fellow bloggers used to sharing snippets of their lives online whether it be opinions on books or more personal posts but how much more are we sharing without even realising? Perhaps at first the ideas explored in Broadcast seem far-fetched, and luckily no one is asking us to undergo surgery to implant microchips into our brains... yet. However advances in technology mean it's becoming increasingly difficult to find a balance between the online and offline worlds and many elements of David's story feel unsettlingly close to reality. As an additional post for this month's book club I thought it might be interesting to create a Bookish Links style roundup with a bit of a Broadcast-inspired twist. Instead of sharing all things bookish, today's post is full of links related to the subjects and themes explored in our March book club pick. 1. In this post Sali Hughes shares her experience of realising she was addicted to her smartphone and how she's tackled the problem. 2. This discussion explores the idea of privacy in the modern world and how we're sharing much more online than we may believe. There's also links included which will take you straight to the related TED talks from those contributing to the article. 3. If you've ever settled in for a relaxing evening with a good book only to be distracted by your phone you'll find Janine's post incredibly relatable. 4. Fitness tracker style bands feature in the novel and this article has some interesting information on the future of wearables. 5. Teen Vogue shared an article looking at the link between social media and anxiety. 6. For a longer read take a look at this article from The Guardian which discusses smartphone addiction, how tech companies can keep us hooked on social media and what all of this may mean for the future. 1. In this TED talk Zeynep Tufekci discusses algorithms, the data social media websites such as Facebook and YouTube are collecting and how this is used to influence the ads we see online. 2. Another TED talk to add to your watch list is Sherry Turkle's 2012 talk about her changing opinion on the internet and how we are both connected and alone all at once. 3. As the book's cover suggests, the story will appeal to fans of the anthology series Black Mirror (available to watch on Netflix). Season 1's Fifteen Million Merits and season 3's Nosedive in particular explore similar themes. 1. Manipulation is a TED Radio Hour episode which includes a section from Tristan Harris that explores the idea of our devices controlling our lives. 2. Technology has come a long way since the 90's when Jennifer Ringley set up a website uploading a black and white webcam image from her apartment every fifteen minutes, allowing the whole world to watch her every move. In this early epsiode of Reply All Alex talks to her about the experience. 3. In the book all of David's thoughts are broadcast live to the world. This episode of Invisiblia titled The Secret History Of Thoughts looks at dark thoughts in particular - what do they really mean and how much control do we have over them? 4. The final link of this roundup is a podcast episode from Stuff They Don't Want You To Know which looks at how much the internet really knows about us and what happens when you 'delete' things online. If you're reading our March book club pick don't forget to send us your feedback on the book via this Google form by 23rd March. Back in 2012 Erin teamed up with Ria to create Blogger's Bookshelf after rediscovering her love of books and hasn't looked back since. She also currently blogs at A Natural Detour. © Blogger's Bookshelf 2012-2015. Powered by Blogger. © Blogger's Bookshelf • Theme by Maira G.